This week I am looking at the names we give our weekdays and the links to Norse and Anglo-Saxon mythology. Click the following links to read about Sunday and Monday and Tuesday. Today it is the turn of Wednesday. The old English for Wednesday is wōdnesdæg or day of Woden. 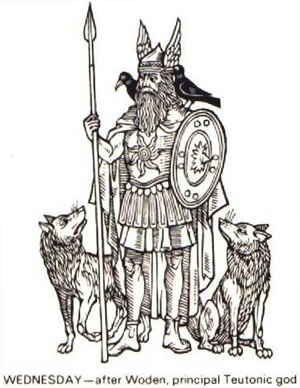 Woden (Called Odin by the Vikings and Woden in England) is the chief of the gods. He is a god of wisdom and thought and fate but also a war god. He appears as old man with a long beard. Has only one eye so wears a patch. He gave away one eye in order to receive the gift of wisdom. Woden can make the dead speak and change men’s fate and destiny – their wyrd. He carries the spear, Gungnir, which never misses its target, the ring Draupnir, which can make other rings to give as gifts and he owns the eight-footed horse Sleipnir which can ride fast through all the Nine Worlds of the Germanic universe. 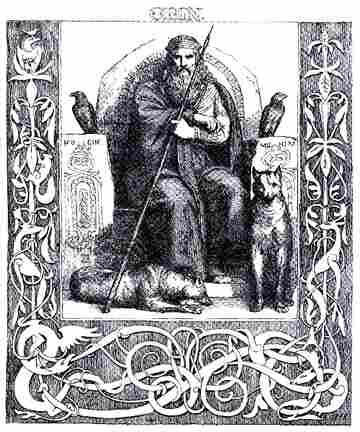 Woden has two Ravens Huginn and Munin (Thought and Memory)who fly across Midgard to tell him what is happening. He also has two wolves, Freki and Geri. It is said that half of those who die in battle are taken to feast with Woden until the end of time in the halls of Vallhalla. In England many villages and towns such as Wednesbury (Woden’s fort/ fortified town) are named in his honour as well as the middle day of the week.